In the West, the Tibetan religious leader Ogyen Trinley Dorje is admired for his youth (he's 25), his looks (he was once introduced at a U.S. event as "His Hotness") and his courage (as a teenager he fled Chinese-ruled Tibet on horseback). But in India, where Dorje, the reputed 17th incarnation of the Karmapa Lama, now lives, he is seen by many in less reverential terms. This week, the second most famous Tibetan-in-exile (after the Dalai Lama) found himself at the center of an Indian media storm after government investigators confiscated about $1 million in cash kept in his monastery. The fact that a sizable chunk of the currency was in Chinese yuan prompted manic headlines in India's ever voluble press, querulously asking whether this was proof that Dorje was a Chinese "spy" or "mole." Dorje, his associates and his allies  the Dalai Lama chief among them  have dismissed the spying accusations, explaining that the money is an accumulation of unsolicited donations from devotees around the world, including Chinese Buddhists living in mainland China. In Dharamsala, the Tibetan capital-in-exile, some 2,000 Tibetans rallied in support of the Karmapa Lama. Facing a crowd massed at his Gyuto monastery on Feb. 2, Dorje urged his backers to "be at ease ... truth will prevail." In a nod to his hosts, he reportedly added, "The Indian government, in contrast to the communist regime in China, is a free and democratic country." All the while, Indian news channels documented the continuing investigation into the matter by the Research and Analysis Wing  New Delhi's equivalent to the CIA. See TIME's 10 questions for the Dalai Lama. The controversy has in part illustrated the still uncomfortable relationship between the Indian state and the many Tibetans who live as permanent guests on Indian soil. Decades ago, India accepted tens of thousands of Tibetan refugees fleeing Chinese occupation, but it has never accorded the Tibetans full rights of citizenship. Many typical transactions, from buying land to depositing foreign currency in Indian banks, are either illegal or a bureaucratic nightmare for Tibetans  which is in no small part an explanation for why Dorje's monastery held the various donations it amassed. Robbie Barnett, a professor of Tibetan studies at Columbia University and an authority on the Tibetan government-in-exile, is bemused by the current Indian hysteria. "It's a bit like saying the Pope is a Chinese spy because he has donations from Chinese followers," he says. But to his Indian critics, Dorje is hardly the Pope. Unlike the Dalai Lama, who embarks on global tours and visits to remote monasteries every year, Dorje sees his movement tightly controlled and restricted by the Indian government. His only foreign trip to date was a swing through the U.S. in 2008. Because of challenges leveled by a couple of rival claimants to his holy position as the Karmapa Lama, he's barred from visiting the Rumtek monastery in the Indian state of Sikkim, one of the most important shrines of his Karma Kagyu sect of Tibetan Buddhism and the abode of the Black Crown, one of the sect's most hallowed relics. In a better era of cooperation between Tibetan exiles and the Chinese government, monks from this monastery were permitted in 1992 to discover and determine that the Karmapa had reincarnated in Dorje, the son of nomadic sheepherders in northeastern Tibet. He remained in China with Beijing's endorsement, but cozy relations were over by 1995  when China handpicked the successor to the recently deceased Panchen Lama  and Dorje was soon blocked from receiving the vital tutelage of the Rumtek monks. A few years later, Dorje and his aides escaped to India following days of treacherous driving through mountain passes, treks around checkpoints and a lengthy spell on horseback. "The Karmapa's escape to India was the single most humiliating incident for China's Tibet policy in decades," says Barnett. After learning of his flight, Beijing initially tried to justify the trip as a mission to find "musical instruments" necessary for Buddhist rituals. See TIME's brief bio of the Dalai Lama. But a coterie of influential figures in New Delhi and elsewhere in India harbor suspicions  backed by little to no evidence  about Dorje's presence, doubting that China would have allowed him to escape. Dozens of Tibetans with lesser means manage to slip across the border every year. Bahukutumbi Raman, a respected political analyst and former Indian government official, wrote on his blog recently that Dorje "could be a planted Chinese 'agent of influence.' " Fear over China's inroads into South Asia plays well in the Indian media. At a Feb. 1 press conference, Prem Kumar Dhumal, Chief Minister of the state of Himachal Pradesh, where Dharamsala is located, used the occasion of the investigation to sound an alarm. "[China is] making air strips, rail lines [along the border] ... China is surrounding us from all sides," he said. Though Dorje seems to be handling the scrutiny with calm and grace, this expression of Indian distrust may have negative consequences for New Delhi. Dibyesh Anand, an assistant professor of international relations at Westminster University in London and the author of Tibet: A Victim of Geopolitics, lamented the overblown controversy in an op-ed in the Hindustan Times. "Hardline officials in China must be laughing their heads off at the Indian media circus," he wrote. "They know that this will not only create confusion in the exiled Tibetan community in India, but will also create disenchantment about India among Tibetans inside China." As the Dalai Lama reaches his twilight years, a disenchanted, disgruntled population is the last legacy he wants to leave behind. It's unlikely Dorje would directly replace him  after all, he is supposedly the realized incarnation of a sect that's considerably older than the Dalai Lama's Gelugpa order. But in the power vacuum that may follow the Dalai Lama's death, no other spiritual leader could rival Dorje's charisma and prestige. 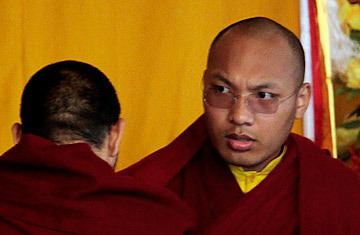 Though articles in the West tend to focus on the Karmapa Lama's penchant for video games and X-Men comics, Dorje is reputed to be an erudite scholar despite his youth, as well as a capable poet and a leader with great "diplomatic acumen," as Barnett says. The question for him now, though, is to what extent he'll be able to express his talents. Hemmed in his monastery in the outskirts of Dharamsala, Dorje cuts something of a forlorn figure, isolated from his parents in China and devotees in India and elsewhere. In an interview with a visiting journalist last year, he complained, "I don't see much of the outside world." And given the current controversy, the curtailed life of the Karmapa Lama looks likely to continue.